It is very unusual to find a bottle bearing the name "Xiaomei", which was the sobriquet of Wang Su (1794-1877), a prominent literatus and painter from the Yangzhou area. His name appears on a small group of bottles from the Li Junting School, including one in the Bloch Collection (Moss, Graham, Tsang, A Treasury of Chinese Snuff Bottles, Vol. 5, Glass, no. 1046, where the connection between Li and the School is explored). 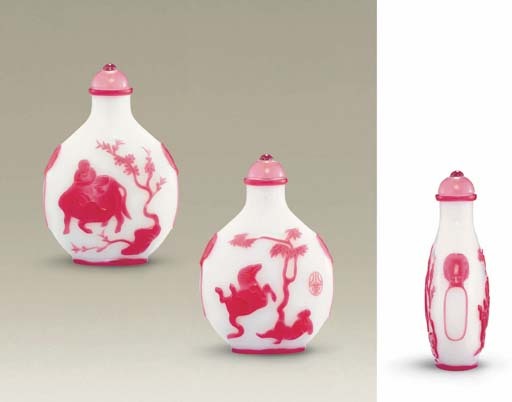 Other examples with his name include one from the Mack Collection illustrated in R. Kleiner, Precious Playthings: Important Chinese Snuff Bottles from the Mack Collection, no. 34, which also bears a seal dating it to 1836. While unmistakably in the style of Li Junting, the range of quality of this group of bottles is broad. One interpretation put forth in the discussion by Moss, Graham and Tsang about the Bloch example is that Wang, who spent his life in Yangzhou, may have been artistically involved in glass production during his youth, and may have provided the designs produced by Li and his fellow workers. It is also put forth that being a known seal carver, Wang may have also developed lapidary skills, and may have carved some of the bottles he designed, which would account for the anomalies in the range in quality of the bottles. Another alternative is that the Li School may have adapted paintings by Wang as a source of subject matter, as it was common enough practice to copy paintings, complete with inscriptions, signature and seals onto literati playthings. The cowherd riding a buffalo is intended to evoke the natural life of the countryside, to which so many busy urban scholars aspired, while the unsaddled horse can evoke the concept of potential, drawing a parallel between the scholar who has successfully passed his examinations and is about the embark on life as an official.